Much like when Amazon bought Woot and pumped resources into the retailer, Amazon’s recent investment of $175 million in online coupon store Living Social has prompted Amazon to kick a little extra business Living Social’s way in the form of a discount. 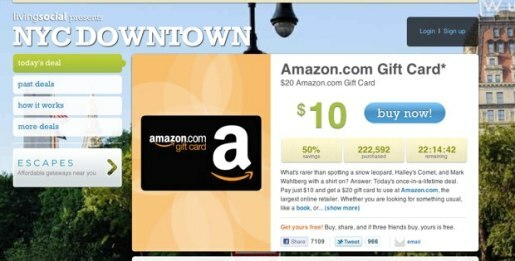 Living Social is selling a $20 Amazon gift card for $10. Click here to buy your $20 Amazon gift card for $10! I can argue with a lot of things, but getting a half-price gift card is NOT one of them. That’s getting $10 in free money, just for giving LivingSocial $10 up front! Who CAN’T use a half-price gift card?! Nobody, that’s who. I’ve already bought my Amazon gift card, and I’ve helpfully placed my affiliate link up above so that when you buy one from LivingSocial, they’ll know I sent you. It’s helpful for both of us, really. Actually, the LivingSocial deal is a rare win-win for all involved. Amazon gets publicity and some extra income from A) the purchase of the cards and B) the amount people spend over $20 that Amazon pockets. LivingSocial gets a slew of publicity and a whole lot of new subscribers (which also benefits new investor Amazon). You get $10 in free money and LivingSocial bucks for sharing the deal with three of your friends. I get $10 in free money and some LivingSocial bucks for sharing the deal with three of you. Everyone wins!